When I was a kid, I loved running about on the beach all day wearing a swimsuit and rarely, if ever, worrying about sunscreen. If we had known in the 70s what we know now, my mum would have made sure I slipped, slopped and slapped with the best of them! Slip, slop, slap is an Australian saying - slip on a t-shirt, slop on the sunscreen and slap on a hat - that is being adopted in many countries now and it's an easy one for kids to remember, so make sure you let them know about it. The reason children are so susceptible to the harmful effects of the sun is that their skin is literally thinner the younger they are, with a baby's being something like 1/5th the thickness of an adult's. You may have already known that, but did you know that a child's skin can burn in as little as ten minutes? Research has shown that six episodes of serious sunburn before the age of 18, doubles the risk of developing skin cancer as an adult. Sunscreen with a high protection factor (SPF) is therefore essential. Apply it 15-30 minutes before going outside so that it has a chance to be absorbed by the skin and apply again once outside. Some sunscreens are now coloured so you can see where it is going on. Babies should never be left in the direct sun as they can burn and overheat very quickly - place pushchairs in the shade whenever possible and always carry a sun canopy. Keeping children in the shade and out of the sun whenever possible is the simplest way to protect them, but remember that shade can be lost as the sun moves so try to find somewhere that will allow you to move round with the sun. Older children should remember the slip, slop, slap rule whenever they play outside in the summer. A good pair of wraparound sunglasses will also protect eyes from the sun's rays and the delicate skin round the eyes - but look for those that offer 100% UV protection. 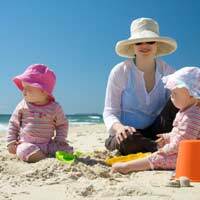 Cover children with cool, close-weave baggy clothing - cotton and linen are especially suitable - and remember to change clothing after playing in water, as wet clothing can lose up to half of its UV protection. Children's swimwear has been taken a step further than this and you can now buy what look like mini wetsuits, with sleeves and legs. These are the complete cover up option with an ultra-violet protection factor (UPF) of 50+. If you're on holiday and the kids are in and out of the pool or the sea, remember that even if it says it is waterproof, sunscreen can wash off and its effectiveness lessens during swimming, so remember to reapply it after children have been swimming or playing with water in the garden. Slapping on a hat is the best way to avoid sunstroke, which can be brought on when the head is overheated - even if the rest of you is covered up with a t-shirt and sunscreen. Make it a wide brimmed one as opposed to a baseball cap style if you can as the brim protects the face and the back of the neck as well. For children, the type of legionnaire's hat with the piece of cloth that covers the back of the neck is ideal. Whether abroad or in the UK seek the shade between 11am and 3pm to avoid the sun at its strongest ultraviolet levels and remember that it's only mad dogs and Englishmen who go out in the midday sun, the locals will be very wisely having a siesta! A leisurely lunch in a taverna or under the shade of an awning or umbrella in the garden is the perfect way to avoid the heat of the day. Don't forget that it is possible for children to get burnt by summer sun in Britain. Even when it is overcast, some 30% to 50% of solar UV radiation can still get through, indeed up to 80% of UV rays can penetrate a light cloud cover. 3-4 Low risk for most skin types, but those with fair or sensitive skin that burns easily should use added protection. 5-6 All skin types need protection, but black skin is less at risk. Avoid the midday sun. 7+ Everyone should cover up, use protection and seek shade/stay out of the sun where possible. I serve as a Safety Trainer for ArcelorMittal Liberia (AML) workforce at Buchanan site, Liberia. I have been training these workers on Fatality Prevention Standards on these topics: Working at Heights,Vehicles & Driving, etc. But I fed guilty when a Community Laison Officer asked me to lecture a group of children who were cleaning the sea coast of Buchanan City. I fed guilty as a trainer because I never have any topic on Children Beach Safety. Oh, I was really guilty. What happens at the end? Only you know. Just help me. Thanks!